Bev Klein | All Pets Medicine, Surgery and Rehabilitation Clinic, P.A. Bev Klein grew up on a farm near Sheldon, Iowa, and graduated from the University of Minnesota Waseca in 1984 with an Associate’s Degree in Veterinary Technology. After graduating she was a surgical technician at Iowa State University College of Veterinary Medicine. She had known Tim since high school and they married in 1984. Their family has grown and she has been very involved in the lives of their five children, and has been an active volunteer in the community. She is co-owner of All Pets and responsible for the book keeping and payroll. 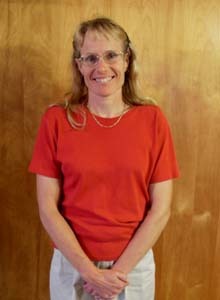 Bev hobbies include running, biking, and camping. Pets have been part of Bev’s household forever it seems, and she is very aware of how much they become part of the family after watching her kids interact with their dog and cats over the years.